Each year, the Skate Circle is a little different from the year before. We never know exactly what will change, but we can be sure the new season will not be exactly the same as any one in the past. Each year, we add new DJs, new music and new skaters. Some skaters move away or stop coming because of an illness or injury. Then again, there are also skaters who return after a long absence and are welcomed back into our Skate Family. 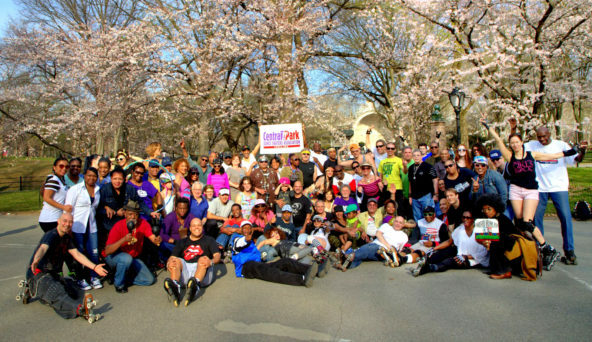 Over the years, we have tried to keep the Skate Circle rolling with the same spirit of friendship, inclusiveness and respect that bonded us when our Skate Family first formed in the late 70s and early 80s. We were skaters, we all loved skating. The park made it different, we were free to come and go. It was free to anyone on skates. It wasn’t a rink, it was: The Park. There has been a long tradition of roller skating on the mall and in the bandshell area. We have a poster advertising a “Halloween Roller Skating Carnival” on the Mall in 1936. There is a famous Skate Family photo on the volley ball courts in the depths of January, 2001. In the background, the whole park is covered in snow, a group of die hards are dancing on their skates in the small area they shoveled out. Some of them still skate with us regularly.